Right on cue, T-Mobile has unveiled its newest rate plan addition in the form of a 3000 minute Family Plan for both Even More and Even More Plus customers. As previously mentioned, some of you may ask why T-Mobile unveiled a rate plan at a price point that’s already offering unlimited minutes? Of course, not everyone needs unlimited minutes but 1500 just isn’t enough. On top of that, currently both Even More and Even More Plus customers can add a 3rd, 4th or 5th line to this offering for just $5. Compare that to the $25, $30 or $40 dollar add a line offerings for the unlimited minutes and you can see where the savings begins to add up. So if you’ve been meaning to up your minutes but haven’t been quite willing to swallow the extra cost of unlimited, your prayers may have just been answered. Hit the link for the full breakdown with text and data. i must be a dunce. why are there two $79 plans whereby one is unlimited and the other is 3000 minutes? am i missing something here…who would choose the 3000 minutes plan. Might want to read the article again where it points out the reduced cost of the add a line, thats the person who would buy it. The person who would buy it would probably be a large family of more than two. It will cost more to add more lines as the cost for those extra lines are far more than adding a regular line to a normal family plan. I believe it cost around 39.99 to add an extra unlimited line to a unlimited family plan. I am on Even More Plus, unlimited. If I want to add a third line to my unlimited plan, it’s $40, + $10 fees and taxes. That’s another $600 annually. If I determined that 3000 minutes is enough for three lines, then it would cost me $5 monthly for the third line, plus $10 fees and taxes. That’s $180 annually. That would result in my saving $420 annually by switching to the 3000 minute plan. Sidenote: But since my GF talks close to 2800 minutes monthly on average, 3000 minutes ain’t enough. She is always on that damn phone. Annoys the hell out of me. Any time I mention going on a lesser plan to save some coin, but she will have to curb her usage, she goes ballistic to where I don’t dare tinker with her precious T-Mobile unlimited plan. LOL. If you are on Even more Plus it would be $30 to add a line. The $40 price point you mentioned is for an Even More contractual rate plan. I know fees and taxes on cell phone plans are hefty but it would not be 10 dollars extra. I am sales rep and i can tell u now it would be no more than $3.00 in taxes for the extra line. It would only come out to 10 more dollars if you got insurance or something. I say kick her to the curb and get a girlfriend that doesn’t talk so much! Moreover, here in California and in San Francisco we pay some fees that others don’t. It’s not much, but I know it’s in there. As to the $40, mine may be old info, but when I called to inquire about adding my sister to the plan, they quoted $40. But that may have included $10 fees and taxes added to the $30? I have 3 kids. My wife and I are on unlimited and my kids have a special rate of $10.00 each with 200 minutes for each additional phone. TMo allows 2 unlimited family customers to add lines for families….you just have to ask about it. really? where is your information coming from? I dont believe any carrier is in the process of phasing out unlimited. Well, that makes sense now. No savings for me, but I’m guessing this is a great deal for some. Based on usage, some customers with 3 to 5 lines on a family may already exceed 1500 minutes. Prior to this rate plan, their only choice was to opt for the unlimited plan, whereby the 3rd, 4th, and 5th rate plan each cost an additional $40 on even more and $30 on even more plus. For customers in this situation who exceed 1500 shared minutes but are under 3000 minutes now have an additional option – the same amount of money for the first two lines, but the 3rd, 4th, and 5th lines will each instead be $5 instead of $40 or $30. Pretty substantial savings for those who fall into the category. Do “we” know why MyFaves plans were terminated? I doubt T-Mobile will ever trump what plans were in place prior to Project Dark. Ah the good ol days! Is it just me or does it seem like T-mobile has no love left for single line individual plans anymore? Seems like any and every promotion in the last year has been for family/multi-line plans exclusively. Not digging that so much. Well T-Mobile’s Focus has always been family. That’s why their motto is sticking together. But I do agree they need better individual plans than what is offered. 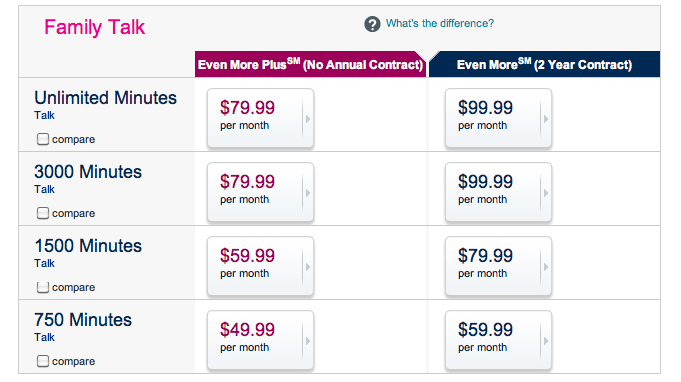 Preferably I would say lower their individual even more plus plans by at least $10 a month…or Maybe by $15 a month. Find a better individual plan out there. That’s a dare. Family plans (meaning multiple lines, not an actual family) are a good deal for T-Mobile because you end up getting two, three, or more accounts guaranteed each time you sign up “one account,” the parent writing the check. That’s a slick move IMHO. Why toil to sign up individuals when you can instead focus on signing one person who will bring in three or four additional lines. The dream account is signing up dad who has a moderately chatty spouse, but two kids who talk, text and use web-based social programs. That assures the dad will comply with his kids orders to “make sure I can use Facebook and Twitter.” End result, dad buys four phones, four talk lines, and four data plans. Dad is happy because he is paying less for those four lines than he would be paying elsewhere, T-Mobile is really happy because they have four new customers paying for talk AND data. Bonus Comment: In these hard economic times here in San Francisco people are getting roommates because they cannot afford to have their own apartments. They are doing the same with cell phones. I know a lot of people who have friends on one cell phone account because of the better deals that can be had on family plans. So those of you on individual plans, call up the ex-GF or your sworn enemy and ask if he or she would like to join you on a family plan. It’s a great way to bury the hatchet. Seriously though, consider adding someone to your plan so you switch to family pricing. I know one guy who likes having a secret phone, so he has two lines for himself. And technically my two lines are assigned to me although T-Mobile calls it the family plan. :) In these hard times get creative folks. What?! Family plans aren’t an actual family? Whew! Where have i been. So a family plan is really multiple lines? Hmmm. The offering is fair and competitive, but not better than any grandfathered plan they have. For example, Family Plan w/2 lines 1000min $49.99, BB Unlimited $19.99×2 and unlimited text $9.99. Before taxes, fees, and discount, $99.96. Still kicking myself for missing the free MyFaves addition to Family Plans. Voicestream / T-Mobile hasn’t been perfect, but they aren’t treating us too bad. I miss the days 7 or 8 years ago when there was more flexibility and decision making power at lower levels. thanks tmo been waiting for this unlimited has been nice but i dont use it enough for the cost and 1500 mins wasn’t enough for 3 lines. the 3000 min plan would save me a fourtune with the 3 extra lines i have a month. Customer care will be getting a call first thing. I have a family plan right now and am paying $10/month for 2 of the lines. Can I call CS and change them to the $5? I just wanna thank this site for the heads up on this last week. I called last Friday and upgraded to the previous unlimited family plan for $99. Because I’ve been a loyal customer for so long, my previous data plans were grandfathered in so the increase to my pocket book was minimal, considering that I was dumping my landline. Ok………..this don’t make sense! Why have unlimited and 3000 minute plans at the same price? Who would get 3000 minute plans when its the same proce to get unlimited? Try reading the article. The answers are within. If you actually READ the article you would know that the difference is the price of add on lines. Your question was asked and answered in the first comment. Did you really write “this don’t make sense”? Nice grammer. Remember that there is the $10 add a line for the unlimited plans (EM+ is what I have, not sure on EM). which gives you 200 minutes per line with free nights,weekends,etc. For example my wife and I have unlimited talk text web, have 2 $10 add a lines with the unl.text included for both lines. Neither go over their minutes and just incase I use family allowances to set the 200 minutes for those lines to curb overages.